Time pressures from life, kids, and friends, and work demands. This makes a daily run the first thing to go when the pressures mount up. The truth of the matter is that you will not make any progress until you deal with these issues and limitations. That’s why for many beginners it’s either a choice of getting a treadmill or end up feeling worse about yourself, getting lazy, and piling on even more weight. One of the many benefits of a treadmill is that, once you start shedding the extra weight gradually, you will be motivated to increase your ​treadmill sessions, giving you the confidence in time ​to add a few outdoor sessions slowly. You can stay warm and comfortable while using the treadmill at home, and no fancy workout clothes required! You can read a book, watch TV or even interact with your family members while you are on a treadmill rather than out running. The treadmill is a family device, that can be used by your spouse, kids, spouse and even relatives and friends when they visit. This is great if you want to get the whole family fit. Build Quality: Lower end models are typically light-weight and use cheaper materials. An excellent way to tell is to look for the assembled weight. A poor quality treadmill will weight less than 25 kg. A good quality treadmill will be closer to 100 kg in assembled weight. Storable​: Some people have enough space to be able to leave their treadmill set up in a spare room. If not you'll want a foldable treadmill that can be easily moved and stored when not in use. User Weight Limit: The runner weight limit is closely tied to build quality. User weight limits typically range from ​100kg (15.7 Stone) to 160kg (25 Stone). If you're only going to walk ​initially you can use a treadmill with a user weight of up ​to 200 kgs. Running Area Size: The bigger the running deck surface area the better. This is often where manufacturers try to save cost so make sure the running track is both wide and long enough to fit your stride. Running areas can be as little as 80cm x 28cm - too small for most tall or overweight runners. Better options are 100cm x 40cm or more. 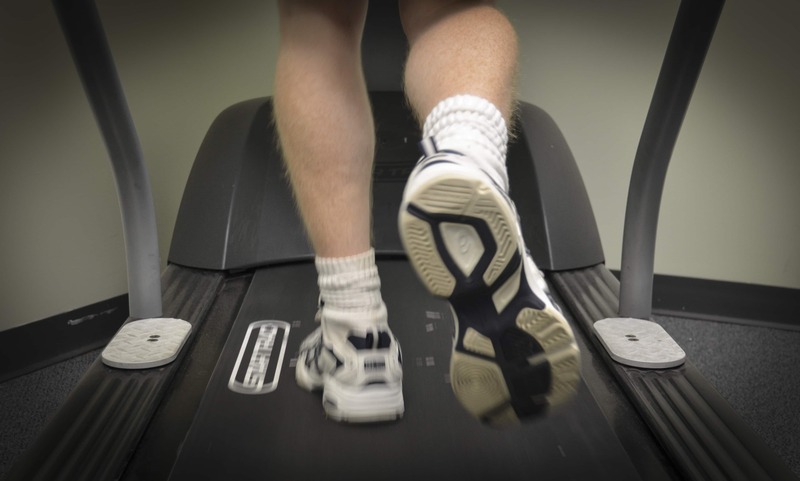 Shock Absorption: this is a feature that ensures that the treadmill absorbs much of the impact of your foot striking the ‘ground’. A good suspension system will not only reduces the forces on your joints but also helps reduce treadmill noise. Motor Size/ Running Speed – This is another area manufacturers skimp on with their low-cost models. Some have no motors at all – referred to as ‘manual’ or ‘magnetic’ treadmills. These are almost always the very low-end cheap models that are not suitable for overweight runners. Look for a with at least 2 HP motors and 10 km/hr+ speeds (more if you want to do sprint intervals). Extra Features: Extra features such reset programs, a large LCD screen, heart rate function, built-in speakers, incline settings and the ability to fold away the treadmill may be important to you based on your preferences. ​Entry-level (Budget):​ Homcom Motorised Electric (check price) Suitable for users up to 120kg (19 Stone). Top speed of 12 km/h. Entry-level models are always a trade-off but if this is all your budget can stretch to this model is the best of the bottom end. Read my review. ​​Upper-range (​Premium): ​​​Reebok ZR8 Treadmill (check price) supports a maximum weight of 120kg​, top speed of 16 kph, and a reasonable running deck size of 126 x 41 cm​. ​This is the same weight limit as ​the ​Homcom but you get an improved build quality. If you're 120-150kg range for user weight and plan to just walk initially you could choose ​this model. Read my review. You should ​go to the commercial-grade model below if you want to ​walk and you're ​in the 180kg to 200kg weight limit range. Commercial-Grade: Branx Fitness Foldable 'Elite Runner Pro' (check price). Maximum weight limit of 160 kg, top speed of 23 km/h, and too many commercial-grade features to list – this is a great treadmill. If you can afford the investment. you won’t regret it. Read my review. Choose the model that’s right for your​ user weight and budget and make 2019 the year you want it to be for your health and fitness!